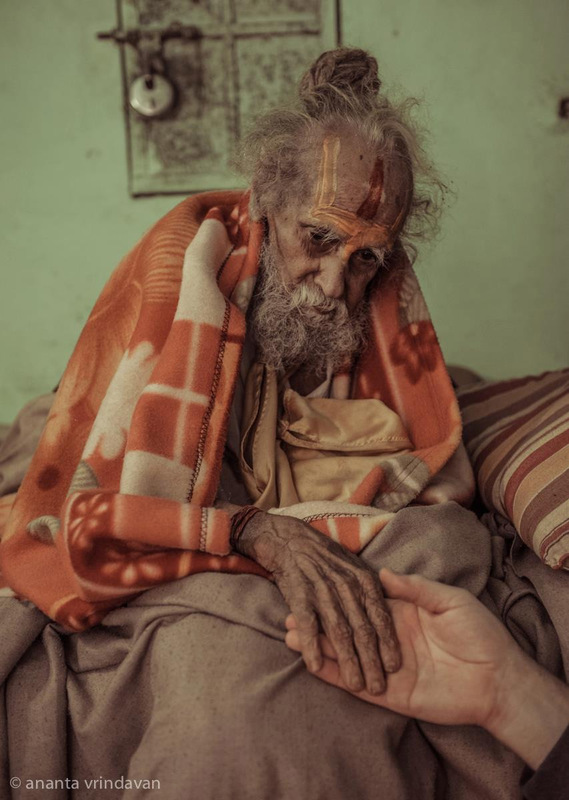 The following photos are of Hanuman Das Baba of Vrindavan, who may be one of the oldest living saints on earth. Once I asked this Baba how old he was. He Replied he could not remember his age, but recalled that he was 12 years old when Jhansi Rani fought the British. You can deduce his age from that. Jhansi Rani fought the British in 1857, so he would be around 170 years old. He mentioned to me that he had grown a second set of teeth after all of his teeth had fallen out, something that happens to some people after 100 years. I have seen and heard of some other babas who also grew second sets of teeth after 100 years. When young, Hanuman Das Baba left his home and came to Vrindavan to become a devotee of Lord Krishna. He founded a wonderful goshala (cow sanctuary) there, where 1,000 cows are currently being served and protected. When he was a child, his mother was a servant of the queen of Jhansi, who died in 1858. The ashram of this Baba is located along the Vrindavan parikrama path, a short distance from the Krishna Balarama Mandir. He stays in a tiny room, just a few feet wide. 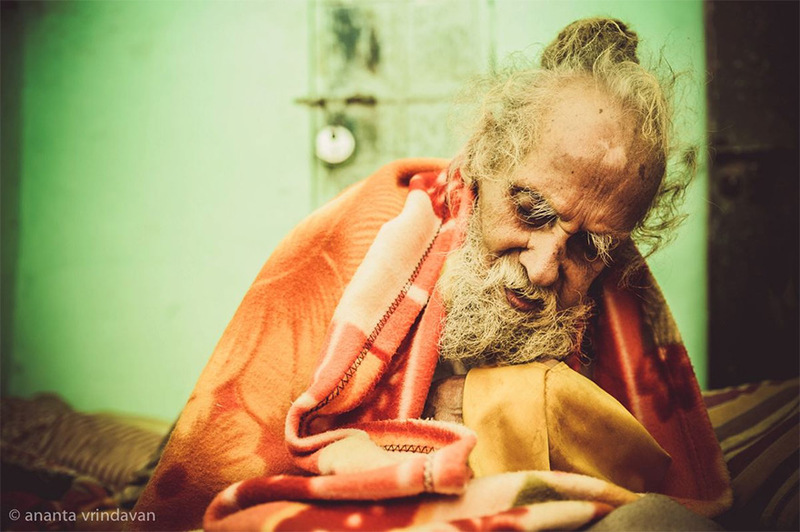 Whenever you visit Vrindavan, please take the opportunity to meet this rare living saint. You will be amazed by his simplicity and humility. indians are always great , specially sadhus live minimum 100 years ..
Shri Hanuman Das babaji left his body few months back. Hope to get baba bless. Thanks Guruji for posting this. Its really a rarest of rare occasion to have Darshan of such living saint at least in picture. His humility and sainthood is very much apparent from the picture itself.His concentrated sight reveals his darshan of LORD round the clock which I am pretty sure. Its a matter of sheer luck to have physical darshan. I am not that lucky which is proved by my circumstances and am compelled to confess this.Thanks for this opportunity. Hare Ram, Hare Ram, Ram Ram, Hare Hare. So, the India is great. According to Hindu Sanskruti. after 80 years he would have com[pleted 1000 poornima days and a ritual called ‘Sahasra Chandra Darshana’ (symbolizing sahasrraara kamala darshan achieved by yoga practices) is performed. 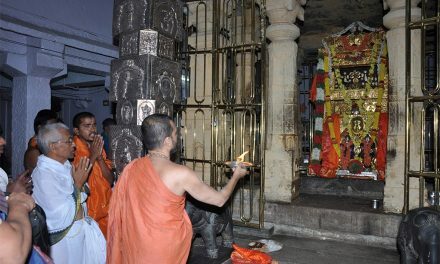 Then he is worshipped as ‘Vishnu’. When whole family members, relatives and frkiends, well wishers come and prostrate to him Shri Hanumaan Baba who has com[pleted 170 what else to say. May Glory be unto him. Similarly Tapovan Swamyji also had completed 170 years, he also had second set of teeth. He was also a great saint. He is a living GOD. Whenever I will visit Mathura, I will definitely seek his blessings. Really interesting story of a living God ! Pranam to him ! I visited him, it has been a great experience! The devotee who brought me to his ashrama told me he passed away last autumn. muchas Felicidades para toda la comunidad Vishnava! hari bol! Jai Shri Krishna. Actually, this dear, sweet soul left his body last year. He was a beloved baba, for sure. He lived very near Baba Neem Karoli’s ashram down the parikrama. Jai ho. IT IS GREAT PLEASURE TO SEE THE GREAT ARTICLE. IT IS UNFORTUNATE FOR ME EVEN THOUGH I WENT TWICE TO BRINDAVAN TO GET BLESSINGS OF GREAT MAHATMA. Than you for the article, its great to see him… this shows the India greatness. Its amazing to see a human being living that long in my lifetime wow!!!!! Has this been verfied by any India authority? and can we get this to the Guness world records? Send that stupid Shankaracharya 2 this Saint 2 seek his blessings and get cleansed. The living saint message is great,but Guinness record not publish this matter to the world . Is hanuman Das Baba is there still I would love to meet him !!! No offense… but sesiously ? Even thought if this guy is 170 years old which itself i believe is some fairytale…. wats up with the saint tag ? God ? does he not sleep ? eat, drink ? excrete like a human being….. does a god really do this ? God dies ? do u guys even like for a minute think outside the box ? Living these many years in this generation is amazing, we heard that in Puranas that the people live for 1000 years but now we seeing live, we are blessed. 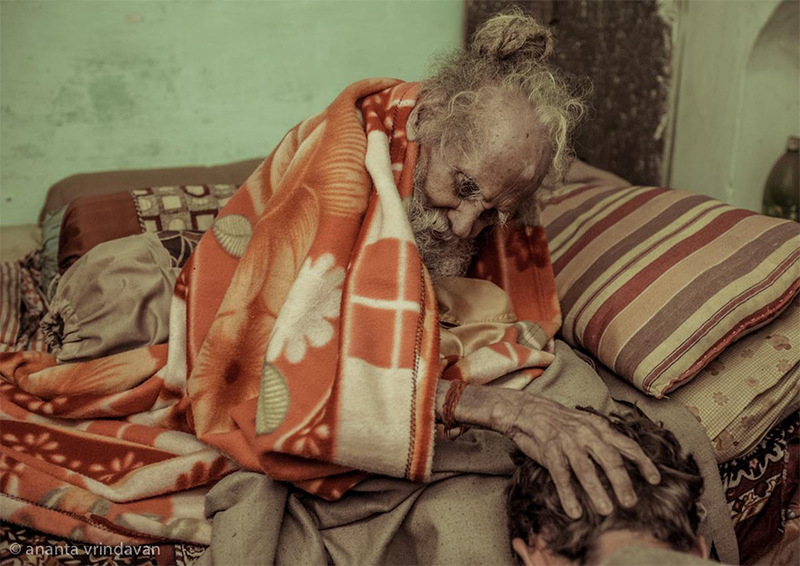 Here is a sadhu, who left his home at a young age and dedicated his entire life to God living in the holy dham of Vrindavan. Is he not a saint? Saint is nothing to do with his age, but with his actions. 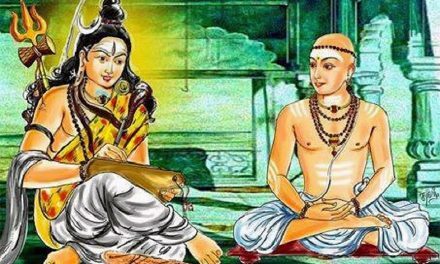 Adhi Shankara lived only 32 years, but he is also universally accepted as a saint. Should the word saint only be reserved for people or other religions like Mother Teressa? Is there any bias there? May i know where is this place ? Our luck to see like that ……………..pranaam…………. thanks. God & Guru is blessing his own globe & kids. Thanks for Sharing the article and i too feel like blessed like the other Devotee freinds who has shared and read this article. Please take up a guru , follow and support your guru either near your home or even if he/she is in a longer distance……. I would request to the article owner also to share “Hanuman Das Baba’s suggestions or advices” for the thousands and lakhs of the article readers who are not yet blessed to get a chance to see him. Apologies if i have used any incorrect wordings or statements in the language. Jai Sri Ram !! Jai Hanuman !! Interesting! what is his diet and could you please share other details about his lifestyle? his age was probably not verified by authorities but he seems to be very old. My understanding is that religion, spirituality are a crucial part of the recipe for longevity, but so are the diet and community/family support, therefore more insigths are desired. Jai Shri Hanuman Babaji……..ki baghwan kare aise logo aur jiye 1000 saal……..may god wish him ………………. Hare Krishna , Dandabat . Why r u alive n prupose of living…only I knows….you will het mokhasha n goes to heaven…..
Can we try and get this officially confirmed by the Indian Govt and help him to be known all over the World through the Guinness World Record please? India is great to have a saint like Hanuman das baba. Thanks for posting his photo. Atleast we have an oppurtunity to see him through this site. My Salutation and Prostration at the feet of Benevolent Swamiji. i am blessed by your presence on this earth. wish i could take your blessings directly. i pray almighty to give me this opportunity to visit your place as soon as possible. I AM ASOTONISHED AFTER SEEING 170 YEAR OLD A LIVING SAINT OF VRINDAVAN HANUMAN DAS BABA AND I WOULD LOVE TO MEET HIM. Thank you. We are very gllad to know Baba’s life . Pray for his blessings. Now that he is no more, I still pay my soulful Pranam to this God. SORRY READ ABOUT HIS NIRVANA LAST YEAR. I WAS IN FACT PLANNING TO VISIT HIM DURING MY NEXT VISIT TO VRINDAVAN WHERE WE VISIT ALMOST EVERY 2ND YEAR. IS 108 NAMES OF POONDI SWAMIGAL AVAILABLE. KINDLY POST Pl. Baba ab nahi rahe.unfortunately I could not had darsan . I am very much thankful to the person who post this article to the public. Is Shri Hanuman Das Baba still at Brindavan? Hare ram Hare ram ram ram hare hare, Jai shri krishna.. I AM EXTREMLY BLESSED TO SEE THAT 170 YEARS OLD HANUMANDASS BABA. MY ANANTHAKOTI NAMASKARAMS TO THIS HOLY SOUL. I shall be grateful to you if kindly provide name and address of such great saints who are still alive. My crores and crores pranam to Sri-Sri 1008 Sri Param Pujya Hanuman Das Baba Jee. Hinduism is the Greatest religion of All times. Our Saints and Satgurus’ guide us all the way. Hindu sahus and great saints proves the greatness and depth of Hindu (sanatan dharma). Jai hanuman baba Ki!!! Bow my head to this great human…. May his noble soul rest in peace. Wish I knew this fact earlier, would’ve longed to see him in person & taken his blessings. Jai Ho Hanuman Babaji ki. I met him and took his blessing few years back. I want to congratulate Babaji’s Shishyas , who took care of him like a baby. My Pranam to His shishyas too. Human being – You can wake a man who is asleep but not a man who is awake – Wisdom words and deep sense of spiritual knowledge was possessed by our great rishis and we all bow down before them . Om Namah shivai. sir,many namaskar to hanuman das baba, he is proud of sanatan dharma ,india ,indians and the humen around the world,as per information through blog regarding samadhi of babaji,it is shoking such a great saint ,a spiritual teacher is not among us to teach us the art of spirituality. If this is true, why is he not listed in the Genius Book of World Record. 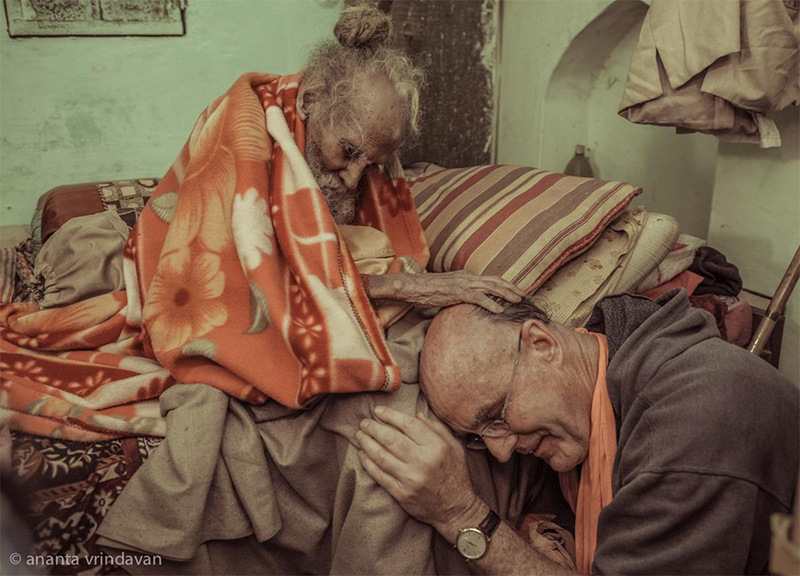 Is there any other Saint like him in Vrindavan, who is more than 100 Yrs old. please inform. tell me if any other saint living anywhere else. To get blessing of a saint really means aid in knowing oneself. Trying to know Self is the highest of Bhakti, Jnana, Yoga and blessing from all saints combined. So walk the path and GOD/Silence/Ananta Shunya/ Paramatma or whatever you call it will be seen soon to be so near that you won’t be able to shake it off. Purity & compassion of indian saints will always keep blessing to world. REALLY I AM VERY LUCKY TODAY TO SEE THE ALIVE PICTURE OF PARAM PUJYA BABA SHREE HANUMAN DAS JI. I PRAY TO GOD FOR HIS HEALTHY AND TO COMPLETE DOUBLE CENTURY. I THIS IS THE AWATAAR OF LORD KRISHNA ON EARTH OF VRINDAVAN. They was my neighbour and now they are no more for 2 years ago. We can’t forget them.